In the beginning was the word ... so we're told. But is that true? Victor Grauer was one of the team which worked with Alan Lomax on his Cantometrics project back in the '60s. He wrote 'I've recently become interested in Cantometrics again thanks to certain new developments in genetic anthropology. Many things which had puzzled Lomax and myself about the distribution of musical styles worldwide are now making sense, thanks to the ability of these researchers to reconstruct some of mankind's earliest migrations from strands of DNA'. One of the results of this work on the 'Out of Africa' theory, currently being explored in the field of genetic anthropology, has been the suggestion that the sung music of the Amazonian Pygmies and Kalahari Bushmen may well be part of the remains of the original culture of homo sapiens and - even more interestingly - may well have developed before speech. Groups of homo sapiens began leaving Africa almost 300,000 years ago, and would have taken their sung music with them. And we know, from the work of the Cantometrics project, that almost every subsequent human settlement has had its own folk songs. So I think it's fairly clear that humans have sung for their own pleasure for countless centuries. This would be one of the reasons why printers have, since the sixteenth century, been making a living providing us with songs and ballads to sing. Would they have done so if there had not been singers to buy them? Would they have printed the words 'To be sung to the tune of .......' if such a song did not already exist? Research on dance and drama have found that what went on in the Royal and Noble courts soon found its way into the countryside, albeit in simplified forms. And the same happened to the minstrelsy of the fourteenth and fifteenth centuries. Songs were sung by ordinary people for their own enjoyment - even if no written record of it exists. It should be clear to most thinking people that an ordinary person of the lower classes, from the 1801 Census until fairly recently, had just three pieces of information about them available to historical researchers: their birth; marriage; and death. Prior to that, virtually nothing. Unless they fell foul of the Law, or did something quite remarkable that resulted in a written record of some kind - that was it! It should also be clear that most of the ordinary singers of songs would not, as singers, find a place in a written record of any kind. This, of course, is one of the problems with 'history' ... most of it relies on the written record, and such records will only describe extra-ordinary events. And if singing for one's own pleasure and the entertainment of one's friends were as normal for most ordinary people as I firmly believe they were ... then there was nothing extra-ordinary about it, and thus little in the way of records of it. Accordingly, I find myself a little irked by this new fashion of saying "This song dates from it's first printing by so-and-so printer in 1650." The admirable Steve Roud was by no means the first to float this idea but, since the success of his recent book Folk Song in England and its widespread coverage in the Media, this view seems, more and more, to be taken as gospel. To be fair, Steve never quite says this in his book, but careless reviewing (and careless listening) has resulted in this view becoming commonplace. Clearly, an historian can only 'prove' that a song dates from the discovery of a 'first known' written record, but common sense demands that something similar must have preceded it. Exactly what that 'something similar' may have been is open to conjecture - we just don't know. Sadly, that is the fate of so much of the history of the ordinary people of the past (and, probably to a considerable extent, the present) - we just don't know! To all my friends who sent messages of 'goodwill/get well' over the past week or so - thank you so very much. I am now home, eating real food, and just had one of the best showers I can ever remember! For those who didn't get the gruesome details, I just had open Triple A Surgery. Initially, I'd not realised just how serious this was but, as I was told in hospital, "It's just half an inch away from open heart surgery!" Despite all the lies dished out by the Daily Mail and its ilk, our experience of the Gloucestershire Hospitals NHS Foundation Trust, Cheltenham General Hospital, and its Vascular Surgery Department at St Lukes Wing, Guiting Ward, has been just as superb as we had expected. Due to the high levels of mind-altering drugs washing through one's system in these circumstances, I can't pretend to remember everyone's names, but my sincere thanks go to the guys in charge, Misters Cooper and Wilson, plus a whole host of Doctors in various specialisms, plus teams of superb nurses led by Edrianne, Lisa, Em, Anna, Lucy, Hayley (and probably several others in the first couple of days when details were very unclear). It's also very worth noting that it took just one month, to the day, between referral by the scanning team, and the actual surgery! The National target time is eight weeks. Also, being so local, my lovely Danny found it fairly easy to get in to see me every day ... along with various friends. Made every new day worth waiting for! Someone told me that Steve Harrison, in his work in the Health and Education departments at Manchester University, was one of those who were responsible for the design and implementation of the annual aneurysm scanning programme for men over 65 in the UK. This was undertaken because an aneurysm has no obvious side-effects - so you don't know you have one, until it bursts ... after which there is only a 12% survival rate! If it was true that Steve was involved, I'm only sorry that he didn't live long enough for me to say to him "Thanks,Mate - you saved my life." Although I feel fine, and am not in any pain (at the moment!) I'm obviously not at the top of my game yet, everything is very tiring, and I suspect that planned outings to Music @ St Marks and the Rosslare Singing Weekend will have to be put on hold for 2019. Sorry to miss those of you I'd hoped to see there this year ... please make my apologies to other attendees. The difference this time is that, rather than waiting almost two years for them to appear, you're now getting them all, almost immediately. This is for two reasons: it looks increasingly likely that these will be the last that MT Records produces ... unless any more turn up out of the blue, as A Distant Land to Roam did. The other reason is that I'm about to undergo some serious surgery, and I have no idea of if, when, or how capable I'll be of such work afterwards. For those of you who may be new to the Download service, each comprises an HTML file of the complete booklet, within which are clickable links to all the songs or tunes as MP3 files. Each Download comes as a ZIP file containing one or more HTML files, a 'sound' folder and a 'graphics' folder. They can be un-ZIP-ed into a single destination (folder) on your device, and run from there. Needless to say, all the MP3 sound files could also be copied to any other device you might wish to use. Since downloads require no booklet printing, case covers, CDs, DVD cases or postage, they sell for a far lower price. Compared to £10, £12, £16 and £20 for the 'normal' publications, the downloads of single CDs are £1.00 or £2.00, double CDs are £4.00, and 3-CD Sets are £6.00. The facility exists to pay more than these low prices, if you'd like to! They can be found, along with ALL the previous MT Records' CD publications, on the MT Records' Download page. The Magazine has had a faily lean year, even by current standards. We've published just 5 new Articles and some 30 new Reviews in 2018, along with 2 Enthusiasms, 4 News items and 6 Letters. By past standards, this is very quiet. On the other hand, I appear to have written some 12 Editorials before this one ... don't quite know why I've been so prolific. 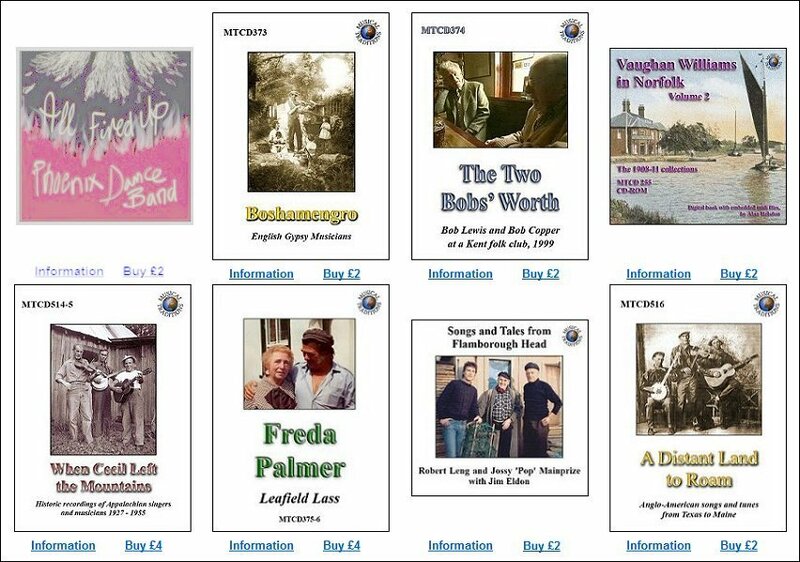 On yet another hand, we have published two more CDs this year than I was expecting: Freda Palmer's Leafield Lass; was followed by Jim Eldon's Songs and Tales from Flamborough Head; and, just recently, Mike Yates' A Distant Land to Roam. I have no idea if there will be any more. No extraordinary rush of orders in November this year, but quite a few - 50 sales - nonetheless. And December has been fairly busy, too - 37 sales - long may it continue! It's interesting to note that, if memory serves, only two people have bought all the MT Records publications of CDs of traditional performers ... one is an Italian and the other is a German! Don't quite know what that says about our appreciation of our own culture. With this my 22nd Review of the Year, I'd like to be able to end on a positive note - but, amidst the Governmental chaos, these remain deeply troubling times. At least there's the possibility of a reversal of Brexit and even a Labour government. In hopes of that, may I wish you all a traditional toast for this time of the year. Joy, Health, Love and Peace! I'm very pleased to tell you that our third 2018 CD is now available. 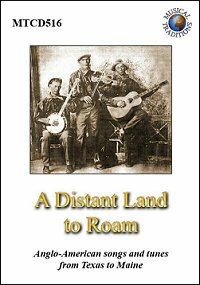 A Distant Land to Roam : Anglo-American Songs and Tunes from Texas to Maine, MTCD516, 25 tracks, 78 minutes. Among these 25 songs and tunes that have gone across the seas, a distant land to roam, you will find some very recognisable versions. Bradley Kincaid sings The Two Sisters and Fair Ellender and Lord Thomas, Bob Cranford sings Babes in the Wood, Bascom Lamar Lunsford sings The Derby Ram, and Emry Arthur sings Jack Hall. Perhaps less easily recognisable are: The Stanley Brothers - Poison in a Glass of Wine; Frank Jenkins' Pilot Mountaineers - Go and Leave Me if You Wish It, Gid Tanner & His Skillet-Lickers - Soldier, Soldier, Will You Marry Me? ; Louisiana Lou - The Oxford Girl; Hattie and Ernest Stoneman - When Shall We get Married, John? And downright extraordinarily, you'll hear The Southern Melody Boys with their Little Ball of Yarn and Blind Boy Fuller with Our Goodman or Seven Nights Drunk. It is now available from the MT Records' website, price £12.00. You may be interested to hear that our 2-CD Set, Freda Palmer: Leafield Lass (MTCD375-6) has been shortlisted for The Folklore Society Non-Print Media Award, the winner to be announced on the 7th November. I can't believe this might be three in a row. Well, I'm sorry but it wasn't three out of three ... However, the shortlisting was felt to be highly merited, and the judges wanted particularly to thank you for your continued support of the award. The decision by John Lewis stores to stop stocking DVD players has prompted me to consider the future of the optical drive in modern computers. Clearly, the removal of optical drives from most laptop computers - and the lack of them in tablets and smartphones - means that, in the very near future, downloads are going to be the only practical way to pass music from one person to another. And that means from a producer to a purchaser, of course. This was one of the two main reasons that I started making the contents of our CD publications available as downloads (sound files as MP3s and booklets as HTML files) back in 2015. The most pressing reason was to try to ensure that, if I was unable to continue with Musical Traditions work, both Magazine and Records, for any reason, someone else should be able to continue to make it all available with very little input beyond keeping up the payments to our ISP and Hosting providers. The small income provided by the downloads should be able to cover these payments. The other reason was to do with the first paragraph above - the future demise of the optical drive and thus that of the CD. One problem raised its head as a result: what format to use for the downloads? This problem was discussed in various Editorials in 2015. That discussion focussed mainly on the format of the CD Booklets ... which I consider to be almost as important as the songs and tunes. At that time it seemed that there were so many types of E-Book, and none that were then dominant, and that the necessary creation software was pretty expensive, that the humble HTML was about the only one that was universally readable. If that situation changes, I shall have to have a re-think. But the choice of MP3 as the sound file format was very simple ... it was universal. But, just three and a half years later, the demise of the MP3 is being discussed by those who discuss such things. Flac appears to be the format of the day. FLAC (Free Lossless Audio Codec) is a musical file format that offers bit-perfect copies of CDs but at half the size of the .wav files that produced them. MP3s, on the other hand, are about one tenth the size of those .wav files. One may feel that, in the age of Terabyte hard drives and Broadband Internet, such considerations are of no real consequence. I'm not so sure - big is not always beautiful - and .wav files do take a long time to download, and are problematic to send as attachments. MP3 is a lossy format, which means parts of the music are shaved off to reduce the file size to a more compact level. It is supposed to use 'psychoacoustics' to delete overlapping sounds, but it isn't always successful. Typically, cymbals, reverb and guitars are the sounds most affected by MP3 compression and can sound really distorted when too much compression is applied. As you may have noticed, MT CDs don't feature all that many cymbals, or reverb guitars, and so our use of MP3 does not cause these problems. Rather more to the point, very few of them feature recordings made more recently than the 1970s, and so don't have a frequency range that would be better appreciated at higher fidelity. Indeed, most feature only a solo voice or instrument - so I did a little experiment. I ripped a solo voice track and a solo fiddle track from a 2018 commercial CD, as .wav, .flac and .mp3 and listened to them played quite loudly. I could detect no difference in the sound. I then did the same with MT CDs of quite old recordings ... with the same results. As regards size, an example track produced a .wav file of 42,082Kb, a .flac file of 22,642Kb, and an .mp3 file of just 4,307Kb. I did not find that big was beautiful, or beneficial. Again, if this situation changes, I shall have to have a re-think. I'm very pleased to announce that our second CD release of 2018 is now available from the MT Records' website. Price £10.00. 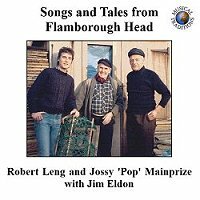 In 1988, Jim Eldon was gathering material for a cassette album of East Yorkshire fireside tales, and a friend took him to Flamborough and introduced him to Robert Leng and Jossy 'Pop' Mainprize. The few snippets of ditties that had been dotted among the stream of tales grew into a whole repertoire of songs as more were remembered. Eventually a cassette of songs and one of tales were issued on Jim's Stick Records label. The fishermen's tales and poaching yarns speak for themselves. There is very little editing in the stories section of this collection - one yarn would spark another and the titles and track separations are just there to help you navigate through them if you want to revisit a particular favourite. Real traditional singing and storytelling. A delight! Nor, as I had feared, will it be our last publication. Mike Yates has just come up with a new project - British songs and tunes from America, from 78rpm recordings. More details as soon as I have them. Not only that, but Doc Rowe has told me that he has 'No end of stuff you might find useful'. Thank God for that ... I was getting bored here! As mentioned below, The Murder of Maria Marten is probably one of the best-known of the 'murdered sweetheart ballads' - of which some 50 English examples are known, and since nine of them were about Maria Marten then there are still 41 left. However, I guess that you are most interested in those that have subsequently became part of the oral tradition, which would reduce the number to about half a dozen. Re: my Experiment - see below. Of the orders I've received subsequent to my little experiment, only 3 out of 24 have been from previously 'unknown' purchasers ... so I really don't know whether that proves anything! Another strange thing I've noticed is that generally, most CDs are bought within the first two or three weeks of publication, and that a good review seems to have little or no effect on subsequent sales. Any suggestions as to why this should be? Also that well-known names sell far better than unknown ones - which seems slightly strange to me. I would have thought that people might already have recordings of several of the songs or tunes by a well-known performer, whilst an unknown performer would be a wholly new, and therefore interesting, experience. However, that's not been the case here - Freda Palmer was not well-known and, despite good reviews, her CDs have not sold well. Our last release was The Two Bob's Worth - with the well-known Bob Lewis and Bob Copper - and has sold 124 to date. Freda Palmer has sold just 24. New versions of web browsers will soon start requiring HTTPS, a secure version of the commonly used HTTP protocol, for sites you visit. You may see a notification like this (right) when you try to visit a site that doesn't use HTTPS. Similarly, most anti-virus software will now, or soon, inform you that a website you're intending to visit is not secure. And what benefit would you, as an MT reader gain? Absolutely nothing, because nothing in the magazine is interactive, requiring any of your personal details. Purchasers of MT Records' CDs or Downloads also gain nothing because all the financial transactions are dealt with by PayPal - which is a secure HTTPS service. So - I will not be converting either the Magazine or the Records website to HTTPS because there is nothing here which is insecure. You can click the 'Not Secure' button if/when you see one, without any concerns. I mentioned in a previous Editorial that every time I publish a new CD, I send out some 1,500 email messages to everyone who's bought an MT CD or Download in the past, announcing the new publication. The interesting result is that almost half of the resultant sales seem to come from people who've never bought one before! One obvious assumption is that these new purchasers have seen details of the new CD in the MT Magazine. Another possibility might be that they've been told about it by word of mouth. A third possibility is that they might have found out about the CDs from my posts/adverts on Facebook. So I decided on an experiment. As you will have seen, on March 13th I announced the publication of our latest 2-CD Set - Freda Palmer: Leafield Lass (MTCD375-6) here in the magazine, and made it available on the MT Records' websites ... but did not send out the announcement email. I did that yesterday, April 6th - the start of the new 2018-19 Financial Year, and also posted an advert on Facebook. In the three weeks between these two dates, I received just four orders for these new CDs ... which seems to indicate that seeing details in the MT Magazine does not contribute very much to sales! So I must assume that these 'previously unknown' purchasers have been told about it by 'word of mouth' which, these days, I presume must mean social media ... and that the information has not been thought to have been 'fake news'. I'm very pleased to tell you that our first publication in 2018 is of a traditional singer, Freda Palmer : Leafield Lass (MTCD375-6). Yes, another 2-CD Set 'complete recorded repertoire' of this Oxfordshire singer. It contains 56 tracks, runs for 132 minutes, and has a 48-page booklet. Recordings from Alison McMorland, Mike Yates, Steve Roud and Gwilym Davies. 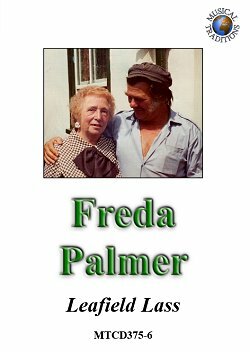 Freda Palmer was born in, and lived most of her younger life in the village of Leafield, Oxfordshire. Later, she moved to the nearby town of Witney, where these recordings were made. From the age of eleven, she was employed as a glover - making gloves, together with her mother at times, but mostly with her aunt Annie, and it was from her that she learnt many of her songs, as they sat across the table together, sewing their gloves. She had a phenomenal memory ... while raising six children she probably didn't have too much spare time for singing, and it was only in her later years that she was encouraged to visit folk clubs and festivals as a performer. But to have a repertoire of sixty or so songs, and to sing 35 of them off the cuff in one day when Alison McMorland visited her was quite an achievement - not to mention reciting the 19 eight-line verses of Murphy's Little Girl without a stumble. Everyone who knew her commented on her delightful, friendly personality - and the account of her life found in these pages shows that she was an almost unbelievably hard-working woman. The don't make 'em like Freda any more! This 2-CD set is now available on the MT Records' website, price £16.00. I'm also pleased to tell you that, despite what I feared, this may not be the last CD of traditional singers that we're able to publish - more to follow when I know some fuller details. Lizzie Higgins was our guest at the King's Head Folk Club, Islington, on March, 11th, 1970. During the wonderfully engrossing evening, she sang a song which we assume she would have called London Lights (Roud 18815), and I recorded it. The song had just three verses, and Lizzie used the first one "See how those London lights are gleaming ..." as a chorus, repeated after each verse - which is why we assume that's what she called it. Steve Roud was hitherto unaware of this lovely little song (and so gave it a new number) and it doesn't appear anywhere in the School of Scottish Studies Archive indices, at least, not under this or similar title. So we may assume that it was a song Lizzie knew of, but did not sing, until her visit to the club in London made it appropriate. It appears that Steve has subsequently discovered two Canadian recordings of it, from 1952 and '64. Fast forward to 2010, when I was preparing MT's May Bradley CD. May sings a song which Steve Roud had said was a version of Blue Eyed Lover (Roud 16637), presumably from its first verse. However, the tune and the three other verses are clearly from London Lights - verse 2 is almost identical to one of Lizzie's, and the other two fit perfectly into that song. My wife, Danny, added them to Lizzie's song, and has sung it frequently in the subsequent seven years. Many people have said what a great song it now is, but no one has ever said that they've heard it before. Fast forward again, to this last weekend, when we were at the splendid Wexford Traditional Singers' weekend in Rosslare (where we've been many times, and where Danny has often sung London Lights). And, suddenly, two different people told us "My Mum used to sing that". One was a purely Irish source, and the other told us "She may have picked it up during the 30 years she lived in London". So, 47 years after we first heard it, we now know that it seems to have been known in Canada, Ireland, England, and from a Scottish Traveller and a Welsh/English Gypsy. This really does prove, if proof were needed, that culture has no respect for social or political borders! It's almost Twelfth Night - so, as promised, the two CDs we produced in 2016 are now available as downloads; they're the last two items on the page. For those of you who may be new to this service, each Download comprises an HTML file of the complete booklet, within which are clickable links to all the songs or tunes as MP3 files. Each Download comprises a ZIP file containing one or more HTML files, a 'sound' folder and a 'graphics' folder. They can be un-ZIP-ed into a single destination (folder) on your device, and run from there. Needless to say, all the MP3 sound files could also be copied to any other device you might wish to use. Since downloads require no booklet production, case covers, CDs, DVD cases or postage, they sell for a far lower price. Compared to £10, £12, £16 and £20 for the 'normal' publications, the downloads of single CDs are £1.00 or £2.00, double CDs are £4.00, and 3-CD Sets are £6.00. The facility exists to pay more than these low prices, if you'd like to! The Magazine has had a faily average year, by current standards. We've published 8 new Articles and some 35 new Reviews in 2017, along with 3 Enthusiasms, 12 News items and 9 Letters. By past standards, this is pretty quiet. On the other hand, I appear to have written some 15 Editorials before this one ... don't quite know why I've been so prolific. On yet another hand, we have published rather more CDs this year than I was expecting: Boshamengro - Gypsy musicians (MTCD373), and When Cecil Left the Mountains (MTCD5145). Then, The Two Bobs' Worth (MTCD374) appeared out of the blue, and we've just had the CD-ROM Vaughan Williams in Norfolk, Volume 2 (MTCD255). All of these have sold fairly well ... and then we had the extraordinary rush of orders in November - 176 sales! And December has been fairly busy, too - over 50 sales - all fingers and toes crossed for it to continue! One new MT Records' CD is currently in preparation ... actually, it's a 2-CD Set: Freda Palmer - 56 tracks, 132 minutes - the complete recorded repertoire. Tapes from Alison McMorland, Mike Yates, Steve Roud and others. I'd like to take this opportunity to draw your attention to the most recent of the MT Articles (just published). It's on Portuguese Fado, the wonderful song tradition of Lisbon. Written by Tony Klein, it is not only wide-ranging and fascinating, but also includes 14 sound clips of historic performances, probably never before heard by any but the most avid enthusiasts. This is a perfect example of what Musical Traditions should be about, at its very best. With this my 21st Review of the Year, I'd like to be able to end as I usually do - but these are deeply troubling times. At least Jeremy Corbyn continues to lead the People's Party, and there's the vague possibility of a reversal of Brexit and even a Labour government. In hopes of that, may I wish you all a traditional toast for this time of the year. Joy, Health, Love and Peace!